Celebrating 78 years and growing - Farm - Home - Garden - Pets! The Watervliet Fruit Exchange has been in the local community since 1940 and continues to grow and evolve to serve area farmers and gardeners. 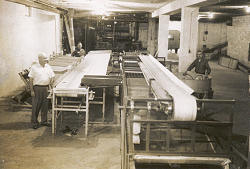 Started in 1940, when 18 local fruit farmers from Watervliet, Hartford and Coloma joined forces in an effort to created a united body for selling their harvested produce, The Watervliet Fruit Exchange originally operated out of the Ashton Equipment Building. This site was located North of the property that was to be the new home for the Watervliet Fruit Exchange on US 12 (Red Arrow Highway). Their initial operation was taking contracts for red raspberries and blackberries - acting as a receiving station for the House of David cold storage located in St. Joseph. Along with that, they were selling fruit packages and spray material. August 4, 1945 was a terrible night for the fruit exchange. A building fire, estimated at a loss of $75,000, was noted as the worst commercial disaster in the history of Watervliet during that time. It was a week before the start of harvesting one of the heaviest peach crops in the area. Watervliet, Coloma, Covert and Hartford Fire Departments responded. They could not save the building due to the inability to locate where the fire started - which was later determined as the rear portion of the second floor, where 70,000 fruit storage containers were located. Destroyed in the fire were the packing equipment and machinery. Saved were the office books, furniture and office equipment, along with some of the merchandise in stock. A new building was erected, with an Open House taking place on Thursday, June 27, 1946...which we are still located at today! For over 65 years, the Watervliet Fruit Exchange processed and packaged Apples, Blueberries, Peaches, Pears, and Plums for Member & Non-member farmers throughout Michigan and Indiana, which were then distributed to stores throughout the United States. Wholesale fruit and vegetables, along with a small retail operation of home, farm and garden supplies are ever present throughout the year, as well. Over the last 10 years, the Watervliet Fruit Exchange has evolved into the Country Store at Watervliet Fruit Exchange offering the latest products for area farmers and gardeners, while still maintaining its old-fashioned character and one-on-one customer service. Known for our year-round Lawn & Garden Center and the area's largest selection of Wild Bird Seeds and supplies, the Country Store now features Local Craft Beers, Wines & Hard Ciders, local seasonal produce and local Raw Honey. We offer Amish-made Funiture, Home Decor and Gifts created by local artisans throughout the year. Our latest success is our Private Label Preserve Line - Blossom Queen. We are your go-to store for beekeeping, farm supplies, chemicals, fertilizers, and small & animal feeds and supplies whether you are a large family farm or a farmette/hobby farm! Our staff has decades of farm & gardening experience to share!